Tom Giardino kicks off the 45+ minute talk by breaking down some overarching principles that have been driving the evolution of Steam over the last decade. First off, the goal has always been to create value both for players and developers. The former should be able to enjoy the best possible version of a game surrounded by the richest set of features. The latter should have an easy access to the tools to manage their games. The other important strategy for Steam is to constantly re-invest into the existing markets, as well to introduce new ones that developers might have hard time reaching on their own. Lastly, Steam never stops inventing new ways for developers to make players happy. Tom explains how these principles have dictated the many investment decisions Valve made over the years as the gaming landscape was changing. Steam Workshop, Early Access, addition of Mac and Linux, VR support, discoverability updates, sales events, supporting new currencies and payment methods, new languages. Year by year, Steam rolled out these new features and isn’t about to stop. One of the newest additions now available in beta is Steam Link Anywhere, which allows players to stream games wherever there is good network connection. Tom’s colleague, Alden Kroll, who has been working at Valve over 13 years on the design side, highlights two features that the company unveiled at GDC. 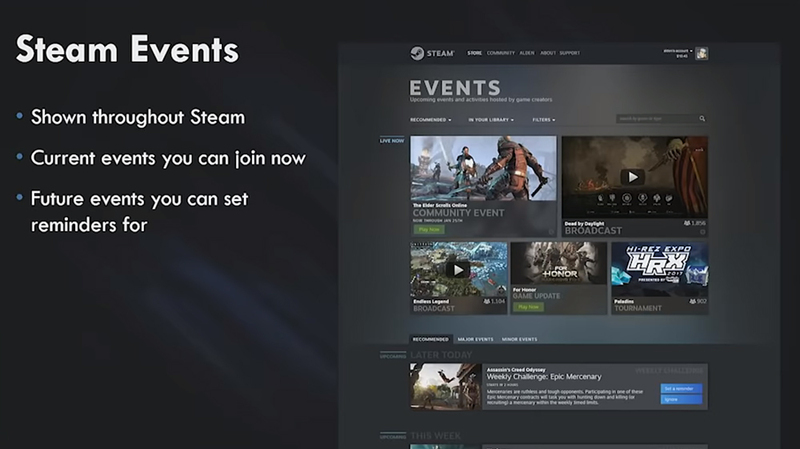 Both of them center around the same purpose – to help developers better connect with customers on Steam. It’s in closed beta with a few developers. Open beta begins within a few months. With this new feature, developers can easily let players know when interesting things are happening in their game: updates, live streams, tournaments, bonus weekends. And it’s not just big multiplayer games. Smaller single-player games can also use events as excuses to put their game in front of customers. The presentation allows a glimpse of the Events home page. It will contain the details of what’s going on and what’s coming up in the game, a call to action, and the settings for the reminder system. Even without signing in every day, customers will now be able to receive notifications via emails, text messages, and calendar apps. Best of all though, the Events system makes recommendations on Steam more compelling. On-going events are a great way to immdediately engage gamers that might have otherwise opted to play at a later time. Alden announces this to a round of applause from the audience. 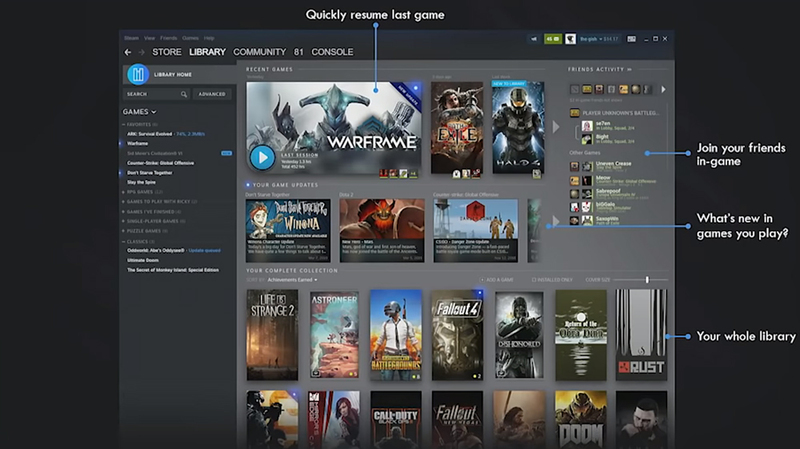 Steam Library is getting a new Home page. The option to resume the last game is still there. But with the Events system in mind, the page will now highlight events in the games players already own. The product page also looks different. It now boasts a big branding space to show off your game. Friends lists, events, achievements, DLCs are here as well. The option to leave a review is now much easier to find. In fact, the new design will encourage players to write reviews and update them. With dozens and hundreds of games in the library, a new filtering system is another welcome addition, which will make it possible to sort games into collections by tag, genre, etc. Advanced traffic tracking. Lets developers see where on Steam players find their game, which events they are most responsive to. Developer and publisher homepages implemented in 2018. Lets followers know about new releases from a particular studio. Update excluding review bombs from the review scores. It is an early iteration introduced only in mid-March. The idea is for a special algorithm to identify surges in review activity so as to alert developers to potential review bombing. It’s still in its early days. In the meantime, developers can use the Call for help button should they suspect review bombing. In the next part of the presentation, Kassidy Gerber, reminds us how Steam used to rely on the open internet to distribute content. 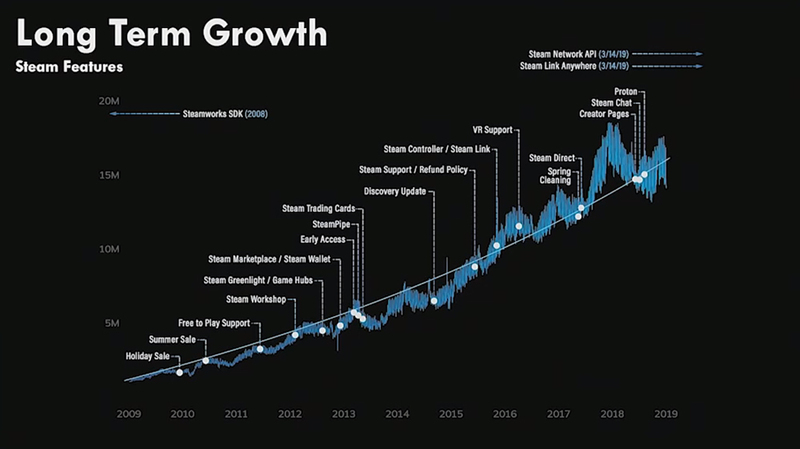 In contrast to this, Steam now uses Private Gaming Network available as of mid-March 2019. It consists of 2500 distinct networks providing stable delivery regardless of what’ happening on the rest of the Internet. This will come in handy around April 14 when the Game of Thrones will return for its final season. Using Steam infrastructure both for Steam and non-Steam copies will provide developers with stable connection for at least 45 minutes, ping time not exceeding 30 milliseconds for CS:GO and 60 milliseconds for DOTA, and protection against DDoS attacks. At the conclusion, Ricky Uy makes an even more convincing case for the Steam world-wide business infrastructure. Ricky emphasizes how important emerging markets are for increasing the game’s audience. And it’s not just growing economies like India or South America, but also established markets like Japan where, surprisingly, there is still a lot of room for growth. Ricky looks back at the history of Steam in Russia. In 2007 Steam was first localized to the Russian language. In 2011, support for the Russian ruble was added. Today, in Russia alone there are more purchasers than there were globally nine years ago. Another interesting example is Japan. 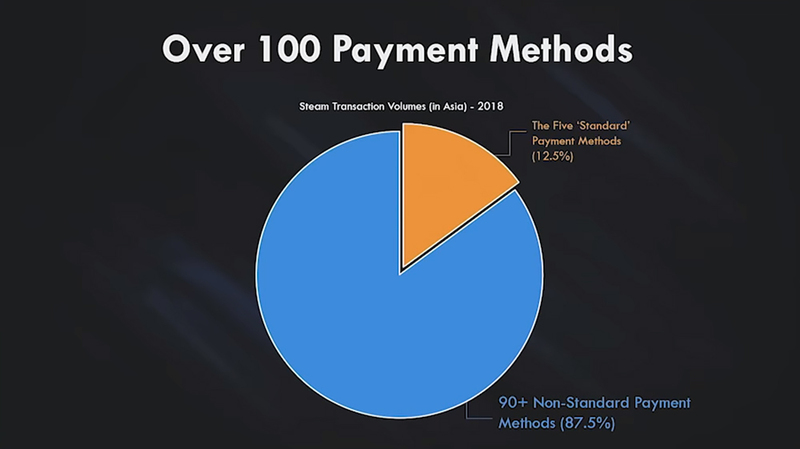 Business development team at Steam initially thought that supporting Visa, MasterCard, American Express, PayPal, Paysafe as the payment methods would provide good global coverage. What they found was that customers in Japan preferred cash-based transactions. In response to that counterintuitive finding, Steam introduced Retail Cards that players can purchase at the convenient retail locations and then redeem when they find something interesting on Steam. Retail Cards are now in use in over 50 countries. As another example of a cultural challenge, Ricky cites South Korea where people like to play at PC cafes rather than home. To address this, Steam has introduced a special program that enables payments from PC cafes. Steam might not longer be the only store for developers to promote their games, but the close dialogue with the community, the introduction of new features and the global hardware infrastructure will ensure Steam’s leadership in the foreseeable future.